The streets belong to everyone – all are welcomed and everybody visits. There are no hard or fast rules and to start laying down rules means you’ve lost sight of the golden rule – the streets belong to everyone. There is, without doubt, a hard and rough side to the streets but also a wonderful side and great things can take place. I’ve been working on the streets since 1985 when I first started as a street trader and as a fly pitcher as a kid. Ignoring the rough side of the streets can cost you dearly, it can cost you relationships, friendships and everything you hold dear. I speak from experience. However, the one thing this experience has taught me is to choose your mentors wisely. Your choice in your mentors will underline what and who you become. By cause and effect, certain characteristics of your mentors will rub off on you as well. As I have already said – the streets belong to everybody – and with that the rough and the smooth. To one person, the streets may be a rough, hard place and to another a social vibrant place. Neither person is right or wrong, both can and do coincide. We have to ask ourselves what we want to make of the streets – it’s up to you. This includes what or where you choose to perform. Remember – what works for one won’t work for another. 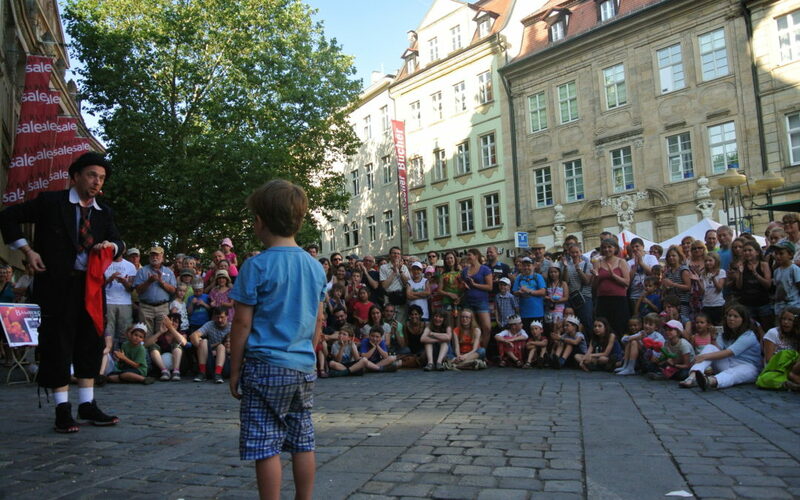 When I started street performing in the early 90s one of the props I used was a wooden duck, you could say straight out of a kid show my audience loved him and so did I. I used a straitjacket and 20 meters of chain. Now ask yourself this question what is heavier – a straitjacket and 20 meters of chain or a Cup and Ball show? I know the answer because I performed and traveled with both. Over the years I have experimented with so many finales I have lost count. From juggling dangerous objects on a roller bowler, working out of my pockets, escapes, and now for over a decade cups and balls that I developed into my own routine. Today I have good people in my life, friends, and mentors. My experience has taught me to choose mentors wisely. Make sure what learn from them is a based on good character and be quick to ask yourself what you can give back and pass on. Lastly, as long as you are respectful and courteous to others and your surroundings, don’t let anybody tell you what you can and cannot do, including yourself.